Till I came across you I was only listening to what I would want to hear and interpret what I heard according to my comfort zone as generally we would like to hear only that which pleases us. But it is HIS GRACE that I had the opportunity to listen to your talks. I must admit here (or I would fail my duty) that your words suffused with divine light, love and wisdom made me listen to them again and again and I started seeing the truth and the efficacy of your words in my daily life once I started applying them. Now it is YOUR GRACE that drew me near to my inner SWAMI. Needless to say, gradually there came a distance between the personality/identity that I was holding onto and myself. The lower me then had to take a back seat or even had to disappear many times. Even in the thick of situations there is no dearth of confidence and inner joy, welling up without reason now. Sairam. My journey with Devas Unlimited started in November 2008 when I first met Shivani. It has been a life changer for me. I was a complete emotional wreck with no hope in sight. Shivani’s words “you have a choice” felt very alien at the time, because I thought I would have to keep leading my life according to other people’s choices and expectations. The Devas session was an eye opener. I got connected to my angels, who have helped me immensely in various situations. Since then I have done various sessions with Shivani, which include Chakra Cleansing (Detox), Divine Guidance classes, Devic healing classes etc. The ‘Cutting Ties Method’ (that I also learnt via Devas Unlimited) has helped to get rid of a lot of Karmic baggage. Crystals and Japamalas have been my companions in my sadhana. 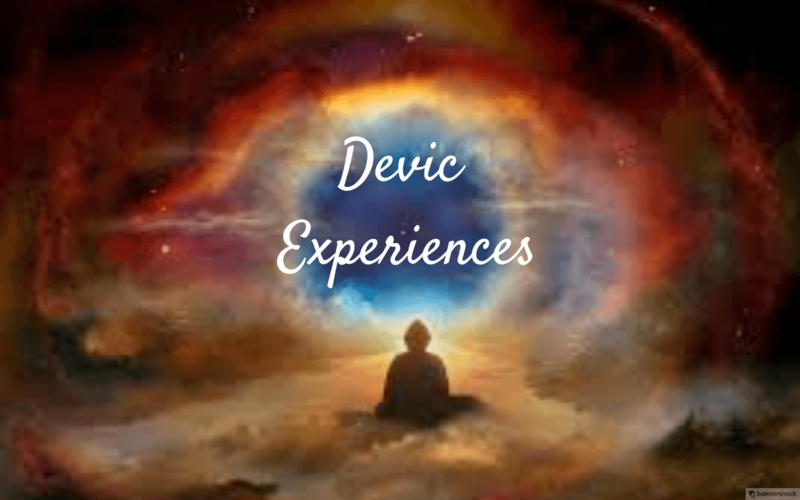 Thanks to Devas Unlimited and Shivani’s love and dedication, I have found the right direction on my spiritual path and I am a calmer, aware and a joyous person now. By swami’s grace happened to meet Shivani at Devas Unlimited in June 2012. Since then, my life has not been same again. Before I was destined to meet Shivani my life was in utter chaos filled with self-hatred. The first session with Shivani was the Spiritual Detoxification session which helped me to understand the deeper meaning of life and to make sense of whatever was happening in my life then. During the session Shivani radiated such unconditional love, peace, and positivity, that I felt a sense of well-being immediately. Then came the opportunity to attend the divine guidance sessions. I was filled with bliss after every session. It helped me to tune into my God self and to make decisions which was coming from a space of love for the highest good of all concerned in a given situation. This was followed by the sadhana classes. the spiritual tools which were shared by Shivani during the session were awesome and helped me to gently open my heart to give and receive love, unconditionally. It was a beautiful experience. Once I started to practice the spiritual tools shared in the session my life took a complete U turn from self-hatred to self-love and the journey continues. In all this Shivani has been and is my angel who has and is guiding me gently and firmly in every step of my spiritual journey with pure unconditional love. Thank you Shivani and Devas unlimited for helping me to realize that i am not here to please other people or to live my life their way but to learn to love and to love other people unconditionally. God bless Shivani and Devas unlimited abundantly to touch many more life’s through their services which helps people to open their hearts to Gods unconditional love which is the birth right of each one of us and to share it with the world. Jai Sai Ram. I went through the spiritual detox thrice and I experienced a huge change in my connection with my higher self and things started to change in my life for good. The different types of crystals suggested by Shivani helped me through my daily life. Their presence is of immense help to me. Especially I cherish wearing every mala I have. My journey with Devas Unlimited started about 5 years back…It opened my life to the joy of being supported by the Universe, of deeper purpose and awareness. The Cutting ties work, Crystals, Sadhana classes, Detox sessions, meditation sessions enabled me to discover and experience something new each time. Life has transformed in unimaginable ways Today, I continue to enjoy their loving support in every phase of life. Thank you, Devas Unlimited. Deepest gratitude. I was always excited to see angels and came to know about Shivani (Devas Unlimited) who can help us connect to angels in 2012. But rather than normal angel reading, it turned out that I was asked to connect to Angels by myself, and ask and get guidance from Angels directly. I was in phase of my life where I just wanted angels to talk to me and give me answers. Thanks to this, if not I would have been just satisfied with finding answers to one issue. I was doubtful if I could do this, but followed my teacher’s guidance. Did the Angels detoxification, Divine guidance course, Sadhana class, I was able to understand, and practice different ways to clearing our mind, our thoughts, becoming aware, connecting to angels or Hi C.
I learnt “Cutting Ties That Bind” method from Shivani. Started practicing the tools, and as i am cutting ties to people, opinions about myself, and roles i was playing due to various reasons. There are so many wonderful things, things started shifting in various areas of my life. Classes with Shivani, and cutting ties has made me so much aware and mindful in any situation and to find solutions from HI C on my own. There is much that i have learnt and learning that i am just grateful for being whom I am today. If you stop for a moment and think what is it that you need in your spiritual journey, it boils down to one thing – ‘ Guidance ‘. You need someone, reachable, approachable to tell you how to go about or assure you that you are in the right path. This is what I exactly received from Devas Unlimited. This is the place where you receive the guidance to “Perceive the Divine Guidance we all receive all the time. It can be from Devas / guardian angels or the God himself, but its quite amazing to experience how much guidance we all receive all the time. It’s just that we don’t perceive and hence might not heed to. Once we do, we can tune in and ask guidance for everything, small and big which makes our journey- both materialistic and spiritual – so easy to handle. I also got introduced to this amazing work called “Cutting the ties that bind” through Devas Unlimited. This work frees us from all the ties that bind us – relationships, desires, emotions and past tendencies, all of which are our past karma and thus become the reason we get stuck in the cycle of life and death. The symbols and meditations used in the technique are very simple yet extremely empowering. The fascinating fact about the work is that the technique trains you to seek security and guidance from nowhere other than your own higher consciousness, thus is enormously empowering. This has become the core of my sadhana now and is a perennial process. It’s a pleasure to attend Satsang sessions held by Shivani twice a month. It’s a thriving environment for a spiritual aspirant where you get to meet beautiful souls with similar aspirations. I feel extremely blessed to have met enlightened souls like Shivani Sinha Sola and Dr.Srikanth Sola. But again, not surprising because it is the divine hand that holds us as we proceed in our spiritual journey, and leads us to places where we receive his guidance. All that is needed is sincere desire and persistent effort. The fact that you are reading these lines is the proof that you too are being guided to the right place. Go ahead and take help in realizing your true self. God Bless. Manager, Sensel Telematics Pvt Ltd.
What I have received is neither measurable nor can it be expressed in words but I will try my best. One of the early experiences with Devas Unlimited was the Golden Age Webinar in 2012. We attended this webinar remotely from our house and the whole house was filled with divine energy. We felt a profound uplift in vibration, something I had never experienced before. The heaviness in my heart flew away. New doors of uplifted consciousness opened. We scheduled an appointment with Shivani and the first time we visited her, she gave us a few effective techniques to silence the mind and open the heart. I was also given an Amethyst Mala. This was my first experience with a crystal. The Amethyst Mala proved magical in releasing stress. I wore it every day to work and it helped me stay calm in extreme situations. Thereafter I purchased a couple of crystals. Its noteworthy to mention that the Devas unlimited crystals are charged with distinct Devic energy which one can feel when you keep them in your environment or wear them as an ornament. I remember purchasing a crystal grid from Shivani to be kept at my workplace (suggested by Shivani). I was not even energy sensitive but the impact of that crystal grid was so profound, I could feel intense uplifted vibration at work. I seemed to have tuned in it to its energy and a specific challenge at work involving many co-workers was dissolved with this energy. We scheduled detox sessions with Shivani and we would curiously wait for our appointment dates. Every time we took a session, something holding us back was released and we could distinctly feel the effect. These sessions enabled me to become a much stronger and authentic person tuned in to my own higher self, leading to a much happier and fulfilled life. Deepest gratitude to Shivani, all Devas, Ascended masters and Angels. My association with Devas Unlimited started in 2012 with swami’s and my master’s grace. I took the spiritual detox sessions and Devas session with Shaguna and few healing sessions with Ruth. I was suffering from lot of anxiety issues. The guidance, support, and unconditional love I received from them is something beyond words and any monetary value will fall short to what I received. I’m in a happy space today. I continue my sessions with Shaguna now more as a retreat. I really wish and hope that many more would benefit from their services. Attending Devas unlimited sessions have left me with a feeling of change. A change in myself and in my life. It has given me inner strength and awareness. I dutifully practiced everything that was taught and with each session I could feel the presence of Devas. This positive energy, I have found, permeates my home, and brings a feeling of peace and renewed vigor. From a more spiritual perspective, I am now able to hear my inner voice which provides constant guidance throughout my day; be it small decisions like what to cook for breakfast to more important ones that have greater consequences. I whole heartedly thank Shivani for the wonderful work she is doing and I highly recommend Devas Unlimited to all those who seek spiritual and personal upliftment. It is indeed Divine Providence that I have had the Blessed opportunity to get in touch with ‘Devas Unlimited’ about a year back. The three sessions I spent with Ms. Shivani Sola during the ‘The Divine guidance’ classes have been very enriching and uplifting. During the course of my practice and recapitulation of the learnings I have had, I realize that there is a positive change in the way I perceive myself, situations and people around me. Upon her advice, I also attended a couple of ‘Cutting ties’ sessions and I must say that it is just amazing and works wonders. All these sessions have opened up many possibilities and solutions that we can find for ourselves. My sincere gratitude to Shivani for all the love and Light she has shared, which has left me with a deeper urge to learn more, practice more and experience more. Alumnus of SSSIHL for women, Anantapur. Sai Ram. After Swami left his physical form I felt a bit shattered in spite of experiencing his omnipresence various times. Earthly people I felt needed a physical presence too to experience the living God. After coming in touch with Devas Unlimited group life took a turning point. All these years what Swami was trying to install in our minds that we are God factor started blossoming in me. The knowledge of angels and Ascended masters given by Shivani during certain sessions made me more confident and fearless in life. The value and energy of Crystals also has been a remarkable experience. Thanks to Shivani and the entire group of Devas Unlimited for giving this Life Support to me. Devas Unlimited has helped me in progressing on my spiritual journey for the past 3 years. Through the spiritual detoxifications, I have been able to connect better to specific Archangels and raise my level of spiritual awareness. The advanced spiritual detoxifications have also helped me to feel more spiritually rejuvenated and helps me connect to God effectively. The Deva Sessions have helped me connect better to my guardian angels (Devas) and have helped me receive accurate and clear guidance on many areas of my life. Crystals at Devas Unlimited are of the purest energy and I have truly benefitted from the crystals as they have enhanced the energy levels of my home, helped me tremendously throughout my day and during meditations. Shivani Sola is truly a wonderful spiritual counsellor who is highly knowledgeable and spends quality time with her clients to allay any doubts and offer advice. I am thankful to have Devas Unlimited in my life. Life is akin to a school. I joined in, perhaps, the 2nd Grade when I learnt of Devas Unlimited (DU) and joined. The quality of teachings and practice moved me rapidly towards ‘graduation’. I was able to actually gauge my progress. I don’t know if I’ve “graduated” but I do know for sure that the guidance I received at DU made a quantum difference in my spiritual quest and quality of life. I look back and am glad Swami brought DU into my life. Devas Unlimited, with its crystals, detoxification methods, frequent satsangs, seminars related to various spiritual subjects, and cutting ties techniques, has really helped me to intensify my Sadhana. In this world of drama (maya), we often tend to lose our attention and concentration in our spiritual practices. But the association with Devas Unlimited helps us to stick on the world of spirituality through its activities. The more we intensify our Sadhana, the better the results will be. I am sure Devas Unlimited will guide and help many more spiritual aspirants in future. Attending Devas unlimited sessions have left me with a feeling of change – a change in myself and in my life. It has given me inner strength and awareness. I dutifully practiced everything that was taught and with each session I could feel the presence of Devas. This positive energy, I have found, permeates my home and brings a feeling of peace and renewed vigor. Devas Unlimited has been a beautiful contribution to my life. It has helped me physically mentally emotionally and spiritually. When I came here to Bangalore in 2016 I felt like a lost and lonely soul. From Devas Unlimited, We learnt how to connect with the Devas and communicate with them on a daily basis. Chakra cleansing with the help of Devas was another beautiful tool that was introduced to us. I could never focus and my mind was not at ease. The Sadhana classes and the meditation classes have helped me tremendously. Different and simple techniques were introduced and there has been amazing results in my life. I am grateful to Devas Unlimited and I continue to be in it always and I thank God for bringing me to Devas Unlimited. Words aren’t really enough to describe something that changes your life forever. But I will make a sincere attempt at trying to express what Shivani and her beautiful work with angels and crystals mean to me. There’s a time in most people’s lives when they hit the rock bottom in every way and then they decide to climb their way back up. Such was my inner life when I met Shivani on the recommendation of my friend. I found long-forgotten loving friends in the crystals I found at Devas Unlimited. I connected with my angels and with archangels and Swami. But the most precious gift I received from these loving people was my connection with myself. My journey is sprinkled with magic and rediscovery…joy…challenges and milestones…tons of learning…and love. The learning continues and so does the love. I am deeply grateful. Sairam! Marketing Development, Zealers Dance Studio. My mind was restless, night and day. And All I wanted was to be redeemed. Faith that the Lord blessed me with. And the compassionate Lord showed me the way! To the doorways of Devas Unlimited! This, in short, is how I came to learn about the ever loving and joyful Shivani Mam and Shaguna Mam at Devas Unlimited. The so-called difficulties and dilemmas that I was facing proved to be Swami’s blessings in disguise. The Meditations and the Cutting the ties symbols that Shivani Mam so lovingly taught me have been nothing sort of life transformational! I found the Maypole meditation especially beneficial as it has opened the floodgates of my heart to receive unconditional Love from my Higher Consciousness and to share it with all my other Selves, unconditionally. I highly recommend anyone reading this to start their day with the Maypole meditation. The Amethyst Japamala that Shaguna Mam suggested to me has had a calming influence on my mind. The inner silence that I experience daily has become more and more pronounced since I started wearing it. So much so that people around me have started enquiring about the practices behind my calm demeanor. I am eternally thankful to Swami for bringing me in contact with such loving and evolved souls. Devas Unlimited has shown me the path to connect to my Guardian angels and Archangels. I will forever remember my first visit to the Devas Unlimited Academy. My practice of Self-Enquiry found fruition there as I experienced Oneness. Devas Unlimited really is the pathway to Love and Joy, Unlimited! PhD student at Sri Satya Sai Institute of Higher Learning. Sairam. After coming in contact and undergoing session with Shivani and devas unlimited, i have found inner peace and satisfaction in my life. I have overcome the tragedy and see life in a different light. Anything that i wish in my mind becomes reality. After devas session there is a lot of positive energy in my house also and has brought peace in the family. I am grateful to Shivani for making this happen. There are some things that are understood by the heart rather than head. when you understand from the heart, you are 100 percent confident about it. And for me, the good work carried out by Devas Unlimited, I have understood from my heart. So I am 100 confident that they are doing work for the spiritual benefits of humanity. As Swami has personally guided them, I would like to take guidance from them. I use the crystals suggested by them on a daily basis. I use Phyllis crystals method and teach my kids also. As a kid, on my own, I had used a method and was benefited. Much later in life, when I read the book Cutting the ties that bind, I could immediately get connected due to my childhood experience. I feel that Devas Unlimited are doing a great work. Devas Unlimited, more specifically, our Hyderabad congregation has been an amazing medium for self-exploration, building inner strength for me. It gave me the courage to both accept the ways of life and to shape the course of our life in ways that I find meaningful. The cutting ties experience has been particularly powerful for me. It has enabled me to delve deeper and consciously disassociate myself with aspects that are preventing me from pursuing my true path in life- be it people, experiences, fears, or insecurities. I enjoy the Sunday meet ups that are a combination of meditation, talking about individual experiences, seeking support in advancing our personal goals. Particular mention to Shaguna and Charu who have been organising these sessions and providing immense support to each of the members. I see myself continuing to be associated and actively contributing to Devas Unlimited. I am grateful to be part of it. I reached out to Devas Unlimited at a disturbed time in life. Until this time, I had kept good distance from meditation and any form of clairvoyance. In my first interaction, I couldn’t so much as to define what really bothered me. When Shaguna spoke of the Phyllis Krystal method, crystals and Devic healing sessions, I was somehow convinced these held the answers. I started my days with the Figure 8, Maypole, and Hourglass, and went on to take three healing sessions. Since then not only have my problems been solved, but I feel enriched with a spiritual perspective to life. Research Analyst, ACCESS Health International. I had discovered Devas Unlimited through a friend in early 2012. Since then I have utilized many of their services including a Deva session, Soul Revival Session, Special Devic Healing Classes, Devas Academy Session, and Spiritual detoxification. I have also purchased many crystals from them throughout the years as well which have helped me in such wonderful ways. The staff at Devas Unlimited are incredibly professional, and so very kind. Every interaction with them is filled with such immense love. I have experienced so many benefits from all the services they offer, which all have positively impacted every aspect of my life. But the greatest and most important change I have seen in myself and my own spiritual journey, is that it is easier for me to align with the truth and live in a state of love and light more than ever before. It is what I truly appreciate about Devas Unlimited. Every service they offer is to empower you and get you back to remembering the truth of who you are. I have changed and grown leaps and bounds in my spiritual journey since 2012, and Devas Unlimited had a lot do with the growth. The Devas, along with the staff at Devas Unlimited have been such a blessing in my life, and I am immensely grateful for the wonderful services they offer. Export Administrator Assistant for Estee Lauder. It was simply the life changing encounter with the loving service provided by Devas Unlimited. I feel it’s a long-awaited gift over many, many life times. At Devas unlimited, you get to learn that Devas – angels are always here with us to guide and protect our lives and it’s just a relief to know THE ultimate truth that we do not need to believe in certain religions or associate with certain organizations to seek for Devine grace. A sparkle of light is put into our physical body and the school of Devas Unlimited teaches us how to cleans our body – the vehicle of Devine sparkles and many different methods to receive Devine guidance as well as the wisdom to realize the true essence of our being. I pray that whoever is reading this, Deva heals whatever hurting you, guides your day, and give it a try to receive life changing encounter with Unlimited. I had the pleasure of taking cutting the ties classes with Shaguna and I’ve done soul retrieval with Ruth. They are amazing teachers that empower you and help you connect directly to your inner self. I still practice what they taught me and because of them I transformed into a better person. I highly recommend their services to anyone wanting to connect to their inner self or deepen their connection to the divine!